On April 21, 1918, some 150 women gathered at a popular hiking trail in Mill Valley, California, and made athletic history. The women had entered the inaugural “Dipsea Hike,” a long-distance cross-country running race along the seven-mile (11.25-kilometre) Dipsea Trail connecting Mill Valley to Stinson Beach in Marin County. The “Hike” – so called to evade a ban by the United States Amateur Athletic Union (AAU) on women’s long-distance running races – took place 49 years before the first woman ran the Boston Marathon, and 53 years before the AAU officially allowed women to enter sanctioned long-distance running events in the United States. And it took off, big-time. Over 85 percent of the 1918 Hike entrants finished the race, many of them navigating the rocky, muddy, root-strewn trail and its lung-busting climbs in the long skirts, blouses and heeled boots that were considered acceptable female attire at the time. In 1920, the Hike drew 619 participants, cheered by thousands of spectators who squeezed together behind rope barriers and boisterously welcomed racers to the finish line. “It took the entire forces of Marin County deputies to hold the crowd back and allow the winners ample space to dash madly on their way,” reported the Call & Post newspaper that year. The Hike quickly surpassed the men’s Dipsea Race — run annually since 1905 — in terms of field size and crowd support. But it wasn’t enough. Despite its overwhelming popularity, the Hike couldn’t surmount the clawing gender biases it had originally shattered. Medical professionals and religious leaders campaigned against the event, citing negative (but unfounded) effects on the competitors’ reproductive health and concerns about the racers’ “immoral” attire (sleeveless shirts, pants, etc.). The Hike was cancelled in 1923, and women were not officially permitted to race Dipsea again until 1971, when the AAU lifted its ban on female participation in sanctioned long-distance running races — although female runners did enter the men’s Dipsea Race, as unofficial participants, as early as 1950. April 21, 2018, marks the 100th anniversary of the women’s Dipsea Hike. Today’s Dipsea Race – capped at 1,500 entrants – sees women and men race side-by-side in a time-handicapped format. The first runner across the line – young or old, male or female – wins the race. Women have claimed that victory 22 times in the 47 years since 1971. Visitors to Marin County can also hike the Dipsea Trail at their leisure, as I did in January 2018. It’s a gorgeous, challenging jaunt, encompassing forests, scrublands, beaches and views that inspire reflection on the victories won and lost, then won again, for women’s long-distance sporting events in North America. 1905 – Inaugural (men’s) Dipsea Race. 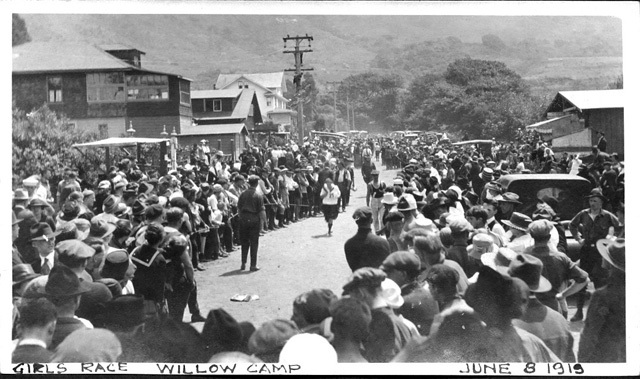 1918 – Inaugural (women’s) Dipsea Hike. 1922 – Last Dipsea Hike. Hike cancelled from 1923 onwards due to medical/religious objections. Dipsea Race (men’s version) continues. 1950 – First woman runs in the Dipsea Race, as an unofficial entrant. 1971 – AAU lifts ban on female participation in sanctioned long-distance running events. 1973 – First female wins the Dipsea Race. Emma Reiman was the powerhouse participant of the original Dipsea Hike series, finishing first or second in four of the five years the race was held. Reiman placed second in 1919 and 1920, then won the Hike in 1921 and 1922. Her 1922 time of 1:12:06 stood as the women’s course record until 1969. Nancy Dreyer was the first woman to run in the men’s Dipsea Race, although she did so unofficially. Dreyer entered the race as an unsanctioned runner in 1950, and thus began a trend of females running Dipsea despite the ban against their participation. Frances Conley made history as the first official female finisher of the Dipsea Race, which she entered in 1971, the same year the AAU lifted its ban against female participation. Mary Etta Boitano was the first female to win the Dipsea Race after the field was officially opened to female entrants in 1971. She won in 1973 — and she did so as a 10-year-old. Boitano came from a family of ardent distance runners. She had run her first Dipsea Race in 1968 at the age of five under the name “M. Boitano,” her hair tucked under a cap so she could pass as a boy. In April 1974, the pig-tailed phenom was featured on the cover of Runner’s World magazine. By age 13, Boitano had run over 40 marathons and logged a personal marathon best of 3:01:15. Megan McGowan was another pre-tween runner who chalked up an impressive streak of results in the early 1990s. McGowan placed second in her first Dipsea Race in 1990 at age 8, won the race in 1991 at age 9, won again in 1992 at age 10 — and clocked the fastest women’s time that year, despite losing four minutes to handicaps — then placed fourth in 1993 at age 11. Perhaps deciding to quit while she was ahead, McGowan has not raced Dipsea since. Shirley Matson currently holds the most female wins in Dipsea Race history. She placed first four times — in 1993, 2000, 2001 and 2004 — a span of years that took her from age 52 to age 63. Matson began running in her late 30s, but the late start didn’t affect her ability to chalk up over 200 age-group victories and 30-plus national age-group records in the course of her impressive running career (which was 100 per cent dirt-free until she entered Dipsea). In 2010, Reilly Johnson became the youngest person to win the Dipsea Race. Just eight years old, the fourth-grader took the lead out of the start gate and never looked back. She crossed the finish line in a time of 1:12:31, 10 seconds faster than her closest competitor, three-time champion Melody-Ann Schultz, and 15 minutes faster than her race time from the previous year, when she ran Dipsea for the first time and placed 199th. Reports vary as to the number of women who entered the 1918 Dipsea Hike. My sources indicated numbers ranging from 148 to 171 to 307. I opted for the lower end of the range to remain consistent with information published by The Annual Dipsea Race. / The Dipsea Trail first appeared on published hiking maps in 1898. In 1905, the trail became the route of a men’s long-distance running race, the Dipsea Race, which still occurs annually (now with a mixed-gender field) and is considered the oldest major cross-country race in the United States. The exact route has changed over the years, and the trail now covers 7.4 miles (12 kilometres). / The name “Dipsea Trail” is likely derived from the Dipsea Inn, a hotel in Stinson Beach that marked the end point of the original race (Roger Robinson, “The Birth of Trail Running – Dipsea: The original cross country race,” Runner’s World, 28 May 2013, https://www.runnersworld.com/races/the-birth-of-trail-running, last accessed 9 March 2018). In 1967, Kathrine Switzer became the first numbered (but not officially sanctioned) female entrant in the Boston Marathon. Female entrants were officially permitted to enter the Boston Marathon in 1972, the year after the AAU removed its ban on female participation in long-distance running events. “The History of the Women’s Dipsea Hike,” The Annual Dipsea Race, http://www.dipsea.org/news/2018-02-11-womenshikehistory.php. Last accessed 9 March 2018. “Remembering Women’s Dipsea Hike Pioneer Edith Hickman,” The Annual Dipsea Race, http://www.dipsea.org/news/2018-01-03-edithhickmanwomenshike.php. Last accessed 27 March 2018. The Dipsea Race held a commemorative 100th Anniversary Women’s Dipsea Hike on April 21, 2018. The event included period costumes and a historically driven program. Friends and family of several original Hike participants attended. Learn more at The Annual Dipsea Race. Lisa Jhung, “Tough Love,” Runner’s World, 24 May 2010, https://www.runnersworld.com/trail-running/tough-love. Last accessed 9 March 2018. The Dipsea Race is run via a time-handicap system, with handicaps determined by age, gender and previous race placement. The field is therefore open for a strong runner of any age or gender to cross the finish line first. For more on the race handicap system, visit The Annual Dipsea Race – Headstarts. Dan Giesen, “The extra mile: At 61, Larkspur woman discovers life in the fast lane,” San Francisco Chronicle, 3 February 2002, https://www.sfchronicle.com/living/article/The-extra-mile-At-61-Larkspur-woman-discovers-2876877.php. Last accessed 15 April 2018. Andy Wilcox, “Dipsea Race makes lifetime memories for female pioneer,” 7 June 2013, Napa Valley Register, http://napavalleyregister.com/sports/dipsea-race-makes-lifetime-memories-for-female-pioneer/article_32b9fd06-d001-11e2-9d21-001a4bcf887a.html. Last accessed 28 March 2018. “100th Anniversary of Women’s Dipsea Hike on April 21, 2018,” http://www.dipsea.org/news/2017-09-19-womenshike.php. Last accessed 27 March 2018. Barry Spitz, “A Brief History of the Dipsea Race,” http://www.dipsea.org/history.php. Last accessed 27 March 2018. “Dipsea Results Search (1996 – 2017),” http://www.dipsea.org/search/dipsearesults.php. Last accessed 27 March 2018. “The History of the Women’s Dipsea Hike,” http://www.dipsea.org/news/2018-02-11-womenshikehistory.php. Last accessed 9 March 2018. “Remembering Women’s Dipsea Hike Pioneer Edith Hickman,” http://www.dipsea.org/news/2018-01-03-edithhickmanwomenshike.php. Last accessed 27 March 2018. Austin Murphy, “Dipsea Celebrates 100,” Marin Magazine, Marin Matters Blog, June 2005, http://www.marinmagazine.com/Blogs/Marin-Matters/June-2005/Dipsea-Celebrates-100/index.php?tagID=557. Last accessed 15 April 2018. Lisa Jhung, “Eight-year-old girl wins Dipsea,” Runner’s World, 14 June 2010, https://www.runnersworld.com/trail-running/eight-year-old-girl-wins-dipsea. Last accessed 9 March 2018. “Mary Etta Boitano Blanchard – Interview No. 9: Our Whole Life was Running!” 23 January 2012, Bob Anderson’s UjENA FIT Club Go For It! https://ujenafitclub.com/ninter.php/15. Last accessed 28 March 2018. Rita M. Liberti, “Trailblazing in Marin: Women’s Dipsea Hikes, 1918-1922.” California History Vol. 81 No. 1 (2002), pp. 54-65. Accessed via http://ch.ucpress.edu/content/81/1/54, 27 March 2018. Roger Robinson, “The Birth of Trail Running – Dipsea: The original cross country race,” Runner’s World, 28 May 2013, https://www.runnersworld.com/races/the-birth-of-trail-running. Last accessed 9 March 2018. Wikipedia, “Mary Etta Boitano,” https://en.wikipedia.org/wiki/Mary_Etta_Boitano. Last accessed 27 March 2018.